Room Pairs | Design Ergonomics Inc. The following is a reprint of an article entitled, “Room Pairs” by Dr. David J. Ahearn. The contents of this article are Copyright © 2000, Dr. David J. Ahearn. All rights reserved. Why exactly is it that most of us believe that the only way to set up an office is with symmetrical rooms? Do we think that we’re going to find the cure for dental hygiene?… just kidding. So if hygiene is a dedicated part of the practice shouldn’t we take advantage of that? What if we could conclude that 35 to 40 percent of an offices operatory count should be hygiene space? (We can). 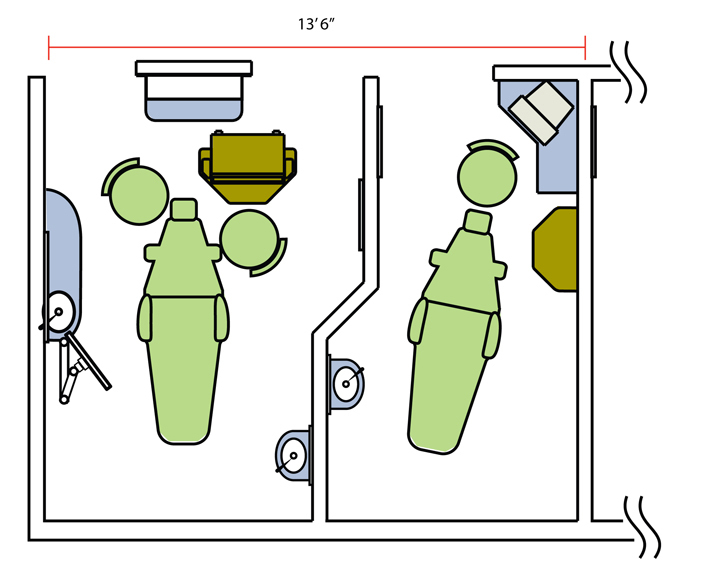 If at least one room in three can be hygiene space then you can utilize room pairs. For larger offices, room pairs can save up to 30% of an office’s overall space. That savings translates to productivity increases, improved communications and huge savings in equipment and building costs. When you increase the layout efficiency of a hygiene room you can greatly simplify the required technology and therefore reduce the cost of hygiene space. Further, we borrow the esthetic (patient) space in the hygiene area from the unused (assistant side chair toe) portion of the doctor treatment room – which is wasted space. This permits both doctor and hygiene rooms to appear spacious and uncluttered. The result is a reduced hallway run for operatories. It’s more efficient. It feels better to patients. It leaves room for other important aspects of the practice… and saves you money.